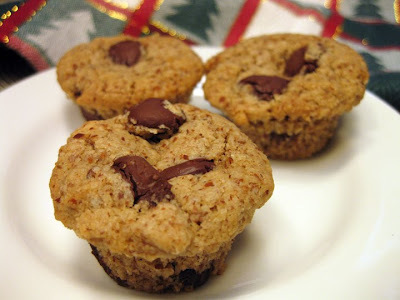 A great variation on the chocolate chip cookie. For something a little different and a bit more special, try this cookie made in a mini muffin pan. It is delicious and it will look a little more sophisticated on your holiday cookie tray. My inspiration for this recipe came from research on using almond flour in baking. I found an awesome website called elanaspantry.com. Elana wrote a cookbook on cooking with almond flour. Elana uses ONLY blanched almond flour in all her recipes and clearly states that her recipes will not work with natural almond meal (ground almonds with skins). I do want to try some of her recipes because they sound amazing. I just ordered some blanched almond flour online and I can't wait to get it and start baking! But in the meantime, I had recently bought a bag of Trader Joe's almond meal. I figured I would experiment with it and see if I could come up with something tasty. I think I did. The cookies were soft and chewy and had lots of chocolate flavor. And even though there is not a lot of sugar or fat in the recipe, you are not left disappointed after eating these cookies. They are definitely satisfying and best of all, they are low carb. Yay!! We can eat more :) They are also much better for you than regular flour based chocolate chip cookies since almonds contain tons of nutrients, vitamin E and protein. They are also perfect for anyone on a gluten free diet. Just make sure you use gluten free oats! I plan an experimenting more with almond flour. I want to try making brownies, muffins and maybe even a cake. If anyone has a great recipe using almond flour, I'd love to hear about it. These are so cute! just bought almond meal at TJ's yesterday! Just made these and they are SO good! Thank you! Wow! This dessert looks incredible! How gorgeous. This post was really interesting for me to read. Thanks for the details.